But was I ever envious at the Japanese Players. Season 3 allows its players to chat with each other while they’re in a course of the host’s choice. Not only that, you can pose your characters in different ways, and get to trade Pang Based Items! Won’t that be extremely helpful for all you pangsters out there? Not to mention all the really cute new Kooh outfits that came out..! Just look at that cute Fox costume! There’s even a new course called Deep Inferno. I hear it’s like Ice Cannon, only it’s fire and magma instead of ice. A friend of mine asked me if I wanted to play Pangya a few days ago… It was unusual, because this friend usually likes to play by himself rather than play with me. What a big surprise when I found new Christmas Clubs for a present! They’re so cute..! Not only that, they have great control! 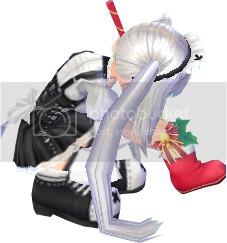 I need more control for my Kooh, because when she’s wearing her Chinese Dress, she’s over-powered, making it difficult to hit a a perfect Pangya! I wonder how long it will take..? My name is Kooh, and I love playing Pangya. Pangya is an online golf game with super cute graphics and lots of characters! Of course, my favorite character is Kooh! She’s probably the youngest character in the game, but she has extremely strong power for a young girl! This blog will be about my adventures with playing Pangya! I hope you find it all interesting, and hopefully I get to play with you in the world of Pangya! Have fun! I hope I can do better with my games..! Minna-san, fighto! You are currently browsing the 「クー」 Kooh weblog archives for January, 2007.